Pour the milk into a bowl; sprinkle the gelatin over the milk. Allow mixture to sit until the gelatin softens, about 5 minutes. Combine the cream and 1/4 cup sugar in a saucepan over medium heat. Stir in the gelatin mixture; cook and stir until gelatin dissolves completely, about 3 minutes. Add the vanilla extract. Pour the mixture evenly into ramekins; cover and chill at least 4 hours. To make the strawberry sauce, combine the strawberries, 2 teaspoon vanilla extract, 1/4 cup sugar, and water in a saucepan over medium heat. While the mixture cooks, crush the strawberries with a potato masher. Simmer the sauce until the sugar has dissolved and the sauce has thickened, about 10 minutes; cool. Remove chilled ramekins from the refrigerator shortly before serving. Dip the bottoms of the cups in warm water to help loosen the custard. Run a thin-bladed knife around the inner edge of each ramekin to loosen the dessert; turn onto a dessert plate to unmold. 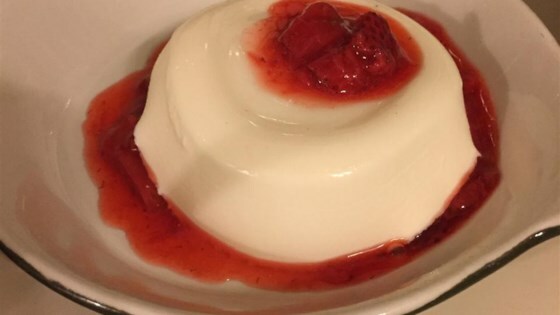 Spoon strawberry sauce over panna cotta to serve.